Κτισμένο το 2015, το Via Hotel Taipei Station αποτελεί ξεχωριστό σημείο σε Ταϊπέι, καθώς και έξυπνη επιλογή για τους ταξιδιώτες. Το ξενοδοχείο βρίσκεται 0.6 KM από το κέντρο της πόλης και σας προσφέρει εύκολη πρόσβαση σε σημαντικά μέρη της. Με την βολική του τοποθεσία, το ξενοδοχείο προσφέρει εύκολη πρόσβαση στους προορισμούς της πόλης που πρέπει οπωσδήποτε να δείτε. Το Via Hotel Taipei Station προσφέρει επίσης πολλές εγκαταστάσεις για να εμπλουτίσετε την διαμονή σας στη Ταϊπέι. Για να ονομάσουμε μόνο λίγες από τις εγκαταστάσεις του ξενοδοχείου, υπάρχουν τα δωρεάν WiFi σε όλα τα δωμάτια, ημερήσιος καθαρισμός, παράδοση ειδών παντοπωλείου, αυτόματο πλυντήριο, ενοικίαση φορητού wi-fi. Το Via Hotel Taipei Station διαθέτει 38 δωμάτια. Όλα τους είναι διακοσμημένα με γούστο και πολλά από αυτά παρέχουν ανέσεις όπως επίπεδη τηλεόραση, μοκέτα, κρεμάστρα ρούχων, δωρεάν καφές φίλτρου, δωρεάν τσάι. Εξάλλου, το ξενοδοχείο διοργανώνει πολλά ψυχαγωγικά δρώμενα έτσι ώστε να έχετε πολλά πράγματα να κάνετε κατά τη διαμονή σας. Όταν ψάχνετε για ένα άνετο και βολικό μέρος για να μείνετε στη Ταϊπέι,το Via Hotel Taipei Station γίνεται το σπίτι σας μακριά από το σπίτι σας. Clean room, excellent location, a bit of walking distance to train station, but it’s not a problem for us as there are many of shops along the way. The hotel also provide complimentary drinks (there’s coffee & tea machine), snacks bar (they even have instant noodles) 24/7. The only thing is their sound proof not very good. But we are happy and had great stay overall, would recommend this hotel. It was a comfortable stay, with unlimited snacks in the lobby for guests. The room even offers an OSIM massager for those who need a little pampering after a long day of walking. The toilet offers in-seat heating, just like those in Japan during the cold seasons. Staff was helpful with travel tips and there were plenty of brochures to pick up in the lobby. 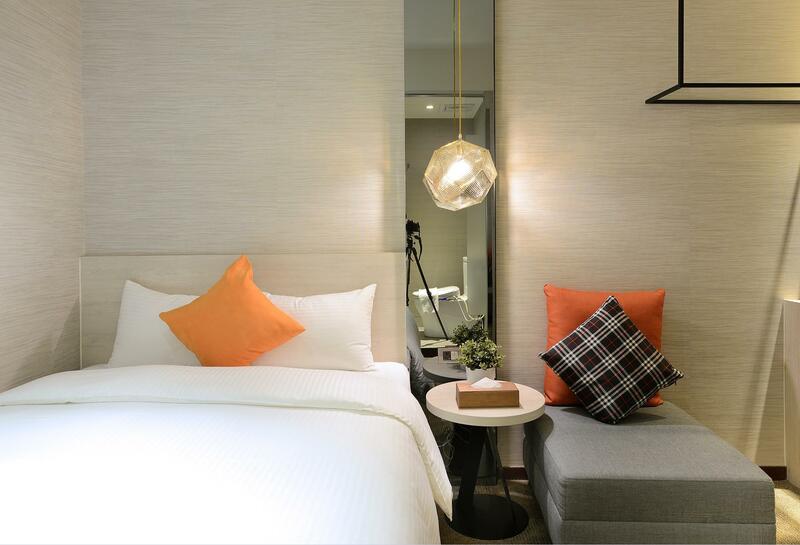 The location is superb where it is of walking distance to Taipei Main Station and Ximending! The staff are super friendly and accomodative. They will give you information on where to go for meals, help to get a taxi and always smiling! The only gripe I have is the standard room that I've booked us without windows and I wish I knew about it when I book it. It's quite sad and gloomy staying in a room without windows! 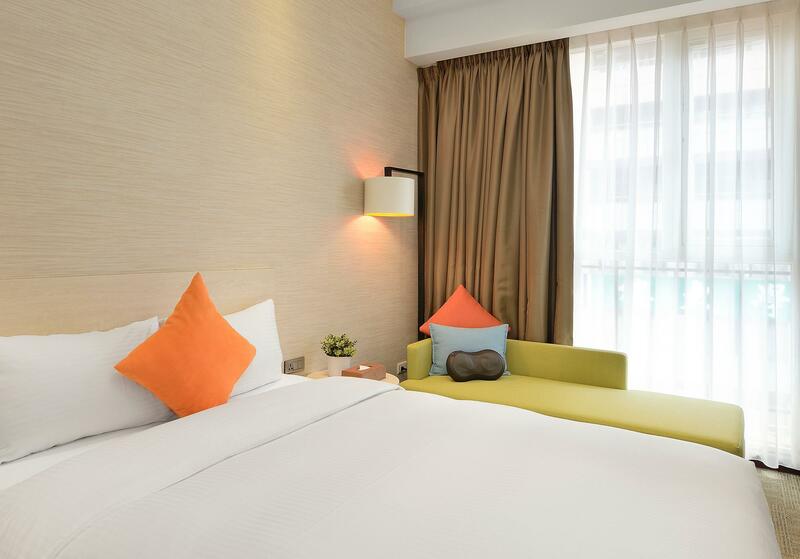 Location is very good, only a short walk to Taipei train station (to Taoyuan airport). We explored the local day market close by. It also has many restaurants and small eatery places, shopping area. I requested our room to be on a higher floor but only given the room on the 3rd floor. But it was still quiet and we able to have a good night sleep. Except we asked for 2 extra pillows the male receptionist only managed to give us one. The friendly & polite housekeeping staff ALAN did an excellent job make our room sparkling clean! Good shower and heated toilet is also a plus. The hotel provided light snacks, hot and cold beverages for the guests. There was free light breakfast such as loaf of bread, cooked tea eggs, muesli for guests. Overall was very enjoyable stay for us. I stay at this Via Hotel, Taipei station location every time I come to Taipei. The room is large, quiet and clean. The staff are really nice and friendly. It is also close to the Taipei Station. Even though they don't serve breakfast anymore, and only snacks are available, it is still my go to hotel when I come to Taiwan. This was my second stay, the bed room is spacious and enough for 2 huge luggages. The bed is very comfortable as well as the comforter. Toilet is clean, toilet seat is warm and the water pressure is strong. The room comes with a small massager for back. There’s a common area where beverages and snacks are serve all day long. I will normally grab a bottle of drinking water in and out of hotel everyday. The staffs are very kind and the check in is very easy. No frills hotel. Greeted with free flow beverages and snacks. For us who brought dad, a good cup of coffee was a must for 3 of us - as we started the day with local breakfast we bought from hotel vicinity, and when we got back to chill in hotel end of day. Mineral water bottles were free flow. Warm and friendly staff and service. Room was not big, but came with what were necessary. Warm toilet seat in winter nights was a nice touch. Hotel provided Cha Tzu Tang shampoo and body wash which were nice to use , and nice way to introduce local brands. We bought from the mall when we saw the brand. Enjoyable stay. Last day, we realised it was a straight walk down the road to airport MRT express. 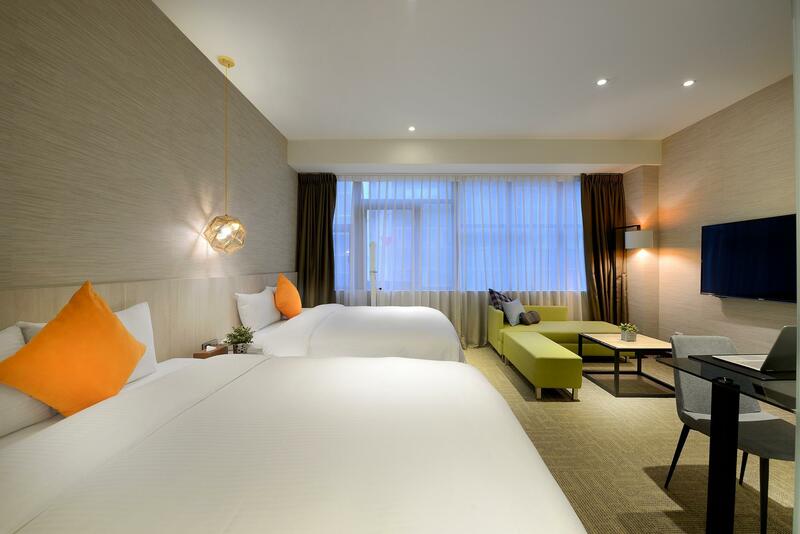 The room has everything you need, I rate 10/10 for the room and the hotel, its just the location was a little bit far which takes around 12-15 mins to reach Taipei Main Metro Station (the entrance is near but its too big it takes some time to reach the subway platform), 10 mins to reach Ximending (Quite near and convenient), family mart and 7-11 just few steps away, very convenient! Highly recommend to small family, couple travelers. The hotel is about 10 to 15 mins walk from Taipei main station, nearest exit is located at Z10 but there are no escalators or lift. Those with heavy luggage should exit using the lift at Z4. It is nearer to get to NTU Hospital MRT station. The room was well decorated and furnished, except that there were no windows and the bed was located very near the bathroom. The bed was on the soft side. The staff are very friendly and helpful and they are very thoughtful in furnishing a relatively good range of snacks and drinks. 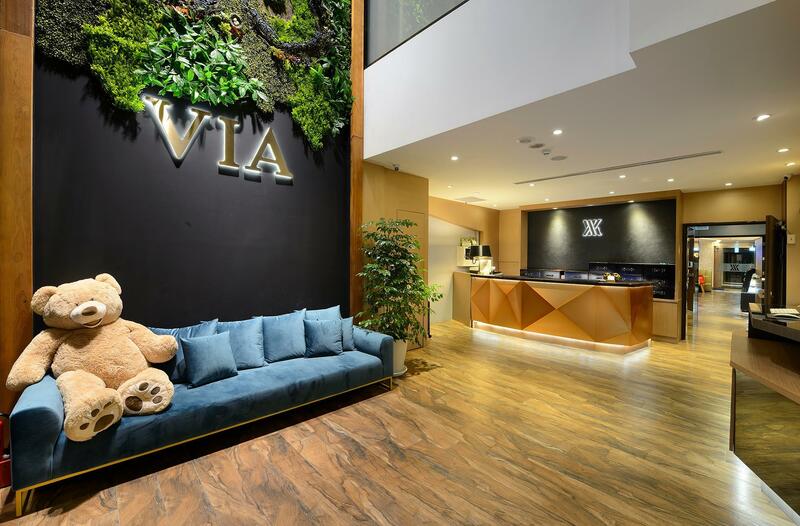 Via hotel is out of my expectation with the facilities provided, free snacks 24hrs and free massage chair below the cafeteria. My room is clean and spacious, loving the remote control toilet too! Location is near convenient store, but personally I find the walking distance to Taipei Main station abit too far. Overall, loving my stay in Via Hotel. 친절하고 위치는 시먼딩과 타이페이역중간이라 역에서 좀 걸어야 하지만 쇼핑몰도 근처에 있고 최적의 장소였던거 같아요. (공항에서 오고가는 국광버스터미널에서 약 10분 정도만 걸으면 됩니다. 타이페이역 맨 끝쪽 출구라 출구만 잘 찾으시면 괜찮아요) 조식은 따로 없지만 컵라면,아이스크림,커피,과자들이 구비되어있고 마사지의자(좀구식이지만)도 있습니다. 체크아웃하고도 화장실, 간식등을 이용할 수 있어서 좋았어요. 직원들도 매우 친절합니다. The room is well-designed and modern. However the toilet is too small. They have a snack bar with a wide variety of drinks and food. The location is pretty ok too, near to railway station and Xinmending. What I would like to highlight is their late check-in service. We waited till 3 but told that it will take some time. Front desk was not apologetic and did not even bother to check on the Housekeeping. They can't even tell us a specific time that the room would be ready. We only need an indication so that we can decide on our plans instead of waiting aimlessly for the room to be ready. If you travelled by train arriving at Taipei Main station, nearest exit is Z10, but you have to carry you luggage up the stairs. The nearest elevator is at exit Z4 but it’s a bit walking distance to the hotel. Upon arrival the staffs are very welcoming. After check in, there’s a mini bar behind where you can get free waters, ice-cream, beverages, tidbits. Do try out the massage chair below the mini cafe after a long day walk. The room is small, but it’s spacious with 1 huge luggage and a carry-on. We loved the bed so much!!! We had a very good rest, overall it worth the price and we will definitely recommend to all our friends. This room is always clean and well maintained by the housekeeper (name Jenny; as written on a card). Unlimited Taiwanese snacks on the ground floor and it's free for all to enjoy. Really recommended for those who likes to stay in a comfy and peaceful hotel. The lounge is great! All day coffee and snacks and bread and dunplings for breakfast. The walk to the subway is about 10 mins but I love walking! There are also a lot of restaurants and stores around. Loved it! Location of the hotel are in the middle of Taipei Station and Ximen Station (blue line), and actually the hotel is more close to NTU Hospital Station (red line) like 5-10mins walk. Since it is a small hotel, so there are not many facilities (like a regular hotel). They do serve complimentary drinks & snacks during your stay on the G/F, and also they have massage chair located on G/F, and massage machine in the room. Stayed for 3 nights, visited Kenting and Kaoshiung for 2 nights, then came back for 5 nights, then visited Jiaoxi for 3 nights before flying home. They kept our luggage for us both times. Room was small but adequate, bathroom clean, modern and bed super comfortable. Massager a welcome treat after touring all day. Safe for keeping valuables and complimentary laundry facilities were a bonus. Staff were amazingly accommodating and hospitable. Felt like we were being welcomed home with a cool drink and a light snack. Location was perfect: central to museums, parks, shopping and many points of interest within walking distance plus close to the train station and metro plus fresh fruit and great food available everywhere. Would definitely stay here again. Thank you, Via Hotel for making our trip memorable! in terms of location, it's walking distance from the nearest MRT station and night market. however, one has to be alert when finding this property or you might miss it. food was indeed overflowing but of limited options. great bed and bathroom too. Overall the hotel is good . The location u will easily walk to the train station . Also able to walk to 新光三越to shop , 7-8 min walk to ximending . If u choose not to walk 70 NT by cab to ximending . If u have elderly I suggest u take cab . Walk out family mart and Watson to shop. Further up nice local food. As for the hotel , front desk staff plump lady very helpful and smiling very time . During the first day check in , she explain very details. Also mention 24 hrs ordering of pineapple tart just pay abit more. ( sorry I forget your name ) For the lady Long hair front desk , please smile we don’t owe u money and ordering of pineapple tart rejected my order . I was lucky I know how to read CHINESE . The hotel also provide 24 hours snack & drinks FOC . Breakfast just simple tea egg and bread . Don’t have to waste money buy mineral water . I will definitely come back again . Σταθμός Μετρό NTU Hospital στα 0.36 χλμ.